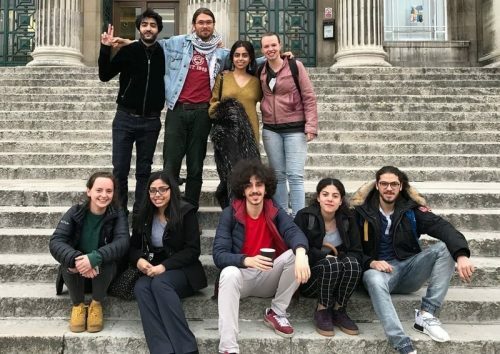 The divestment decision has been hailed as a win for Palestinians and the BDS movement with student groups across the country replicating this campaign. 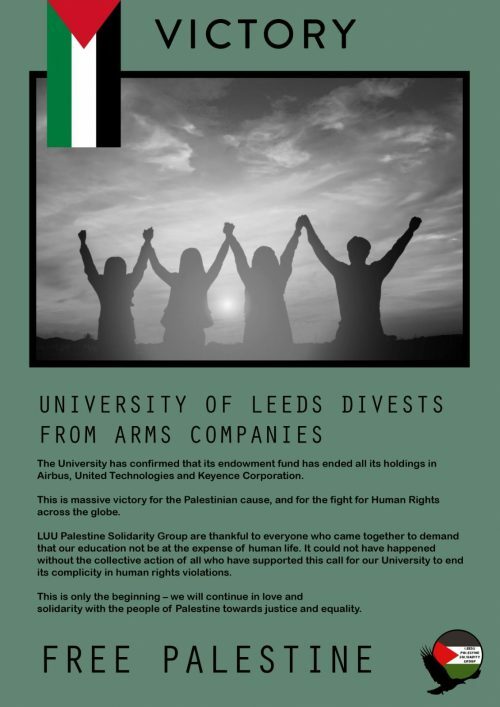 Following an intense BDS campaign by the Leeds Palestine Solidarity Group (PSG), which launched little over a year ago, the University of Leeds recently revealed through a spokesperson responding to an article in the student newspaper, The Gryphon, that it has divested from 3 out of the 4 companies targeted by the campaign – Airbus, United Technologies and Keyence Corporation. The fourth, HSBC, is currently under monitoring and in dialogue with the University’s investment managers, according to the university spokesperson. 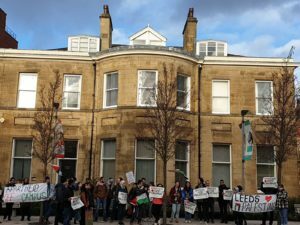 The Leeds University campaign for divestment came as a direct response to the 2005 Palestinian call for Boycotts, Divestment and Sanctions (BDS), which calls upon the global community to end all links with companies and organisations complicit in the occupation. 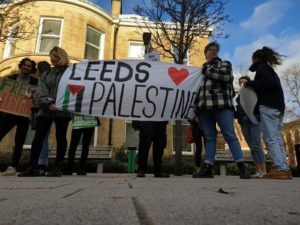 The Leeds campaign involved various events and actions, including sending out Freedom of Information requests, holding an Israeli Apartheid Week, hosting debates and speakers, and staging mass demonstrations. On May 15th this year, a 100 strong protest demanded the university divest from companies complicit in the occupation. Events such as these were matched with the society maintaining a strong and constant presence on campus, gathering online petitions and finally by writing an open letter to the Vice Chancellor, signed by nearly 500 students, 23 academic staff and 20 student societies raging from media to faith to sport societies. This coalition of student societies was a significant contributing factor to the success of the campaign. The strength of inter society solidarity was strongly displayed, with a range of human rights groups, cultural societies, and political campaigning societies all standing with the Palestinian cause in protests, co-hosting events to highlight the links between struggles, and co-writing public statements of solidarity. Inevitably, there were negative pushbacks and abuse from right wing groups online to try and defame our group and undermine our efforts. More pressingly, in an act similar to many other responses to BDS wins in the past, the University itself refused to admit its decision has been at all influenced by student campaigning by Leeds PSG, instead citing its recent adoption of a ‘climate active strategy’ due to student campaigns on fossil fue l divestment. However, this reasoning rings false when faced with the fact that none of these 3 companies are included as targets in the Leeds University Fossil Free Campaign. Furthermore, the university’s most recent public portfolio details investments of over £3.5 million in Shell and BP, clearly highlighting the contradiction between its statement and its actions. Universities and powerful institutions almost never admit to capitulating to pressure from the grassroots or activists when deciding to take action, that would mean the university would validate student activism and give the green light for students to accelerate their efforts and could potentially even make room for more campaigns to grow amongst students if they believed it would work, so this excuse put on how our tuition will no longer directly fund killing is expected and is a smaller battle compared to the fact that the hard part is over and the university has divested. Regardless of any setbacks and struggles, we continue campaigning for justice and equality. This week, on the 29th of November, 30 student groups across the UK will hold events and demonstrations on their campuses calling on their universities to divest. On top of that students at Manchester, Newcastle, Birmingham, Kings College, St. George’s, Sheffield, and Leicester universities are all launching open letters to their vice-chancellors to follow in Leeds’s footsteps. The student movement as a whole is growing, and learning the strength of unity through intersectionality.